100 Lessons now streaming on Monty’s Equus Online University. This week: Monty and Georgia on the process of desensitization. Join the revolution in communication and share the FUN of horses in an exciting new way every week! 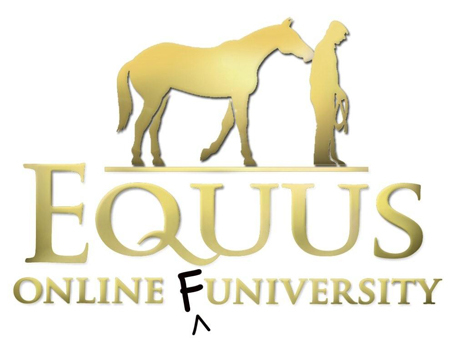 Equus Online Uni students experience Monty teaching on streaming video from a virtual round pen with 24/7 access; interactive questions and answers, a forum and audio downloads! Who are your heroes now? I read your books and followed your career. You seem to have met many influential persons over the years. In retrospect who do you look up to now? In the past 15 years since my first book I have written extensively about individuals that I considered heroes during the course of my upbringing. Setting aside the horses that I considered my ultimate heroes as well as Sister Agnes Patricia, my 8th grade teacher, I will confine my comments to those that were outside of what I would call the immediate family. The horses and Sister Agnes Patricia were as close to me as any brothers and sisters could have been. As a child doing stunt work for the motion picture industry I certainly looked up to the likes of John Wayne Joel McCrea, Jeff Chandler, John Huston, and Elia Kazan. While James Dean was in my life intensely, it was unfortunately for a short period of time. I think my primary heroes during my youth were competition horsemen; Clay Carr, John Bowmen, Gene Rambo, Jimmy Williams and Barbara Worth to name a few. As I neared adulthood I found my hero core moving to a more cerebral group. I reached out to admire global heroes like Gandhi along with university professors such as Dr. Applegarth and William Gibford. Looking back on my evolving listed influences I hold all these memories as being critically important to my development. In recent years however I have found my allegiance to human individuals shifting significantly. It must be about 12 years now since I opened my eyes to the fact that if my life’s goal is to leave the world a better place for horses and for people too, then I should be shifting my hero attention to those who are working to affect progress in that area. I have awakened to the fact that this role is currently being filled by the generous students that are investing their lives to the effort of learning my concepts and passing them on. 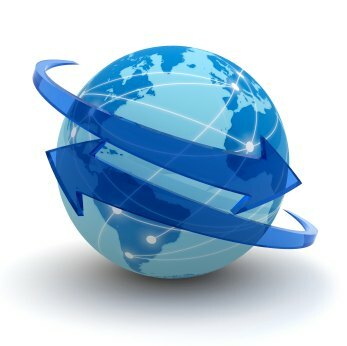 It is the legions of people who read my books, watch my DVDs, enroll in my courses and study my Equus Online University that eventually will be responsible for causing my life’s goal to be accomplished. I now know that it will not be possible to fully achieve my life’s goal in my own lifetime. I believe it will be the next generation that will cause my concepts of violence-free training to be considered normal, not me personally. It is with this communication that I would like to announce to the world that I have a whole new family of heroes out there. There are thousands of individuals who have dedicated the balance of their life to the education of my concepts. They are the shepherds of my life’s goal just as surely as they can put it in a container and carry it over the next several decades causing the world to see the extreme need for change the horse industry has needed for thousands of years. I wanted to tell you all about the week I just had. After I returned home from Monty’s Riding with Respect clinic at Flag Is Up Farms, I went by the barn the next day to check on Frenchie. 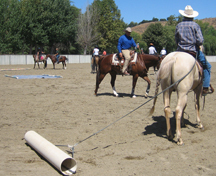 My trainer was there and said “so I guess your clinic was a bust… I told you it was a waste of time”. I replied that the clinic was the best thing I ever did, both for me and Frenchie, and that it seemed as if I gleaned a lot more knowledge then what could possibly be given in 3 days. She then asked me not to be talking about these “so called techniques” with her other students. I was offended to say the least. Many of the other students asked about my experience and I was happy to share. I then went back to the barn on Wednesday and told my trainer that anyone who rode on Frenchie was not allowed to use a whip or bat and that I had a new bit for her. She refused to follow my instructions so on Sunday I moved my horse to a new barn. Once I left six other students left too. They all want to take a Monty Roberts clinic and thanked me for giving them the courage to make the change. I spoke to the trainers at the new barn (before I moved Frenchie), told them what my philosophies were and that I no longer wanted my horse to be a “lesson horse”. I also said that I wanted no negative feedback about my clinic and what I learned, as I was sure that I would return for more clinics with Monty Roberts in the future. They were so enthusiastic that I was willing to learn more about my horse and cared about her. So far Frenchie is more calm and peaceful than I have ever seen her. Once her phobia, she now lets anyone who approaches her correctly, pick up her feet. And anytime I go near her feet she just lifts them up without me having to ask. This is probably more information than you all needed, but I am so proud to have put my horse first that I had to share. Thank you for your interest in my non-violent Join-Up methods. The positive feedback from the E-Newsletter readers has been very gratifying. You can help me continue to make the world a better place for horses and for people by sharing this information with your friends and colleagues. Forward this on and invite them to sign-up before next week to receive my free weekly email. 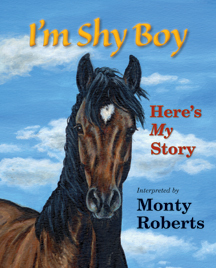 Your friends can also sign-up at https://www.montyroberts.com by entering their email address in the ASK MONTY sign-up box.